One thinks of late 19th century Boston as the most traditional of American cities, and cedes grandeur to New York, and innovation to Chicago. 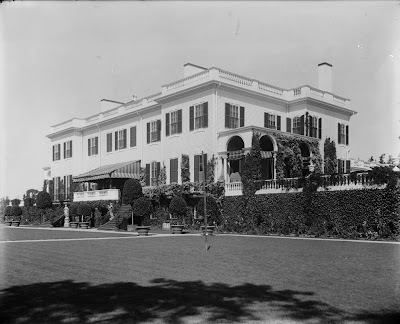 Yet, in Brookline, a fashionable inner suburb, could be found two of the giants of American architecture and landscape, H. H. Richardson and Frederick Law Olmsted, living next door to each other. 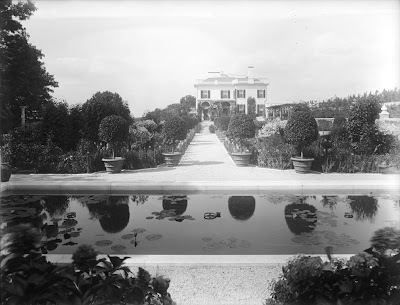 Across the street was Charles Sprague Sargent, whose influence on landscape design was nearly as great as that of Olmsted himself, and around the corner could be found the country house of art collector Isabella Stewart Gardner. 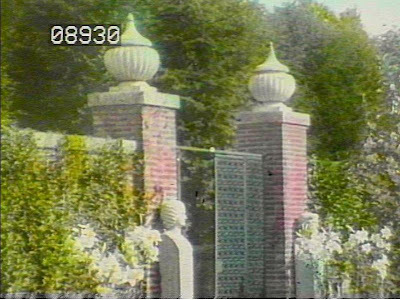 And near century's end, down the road another mile or so, one of Boston's greatest heiresses and her husband were about to create a garden that would have a profound effect on landscape design for the next three decades. 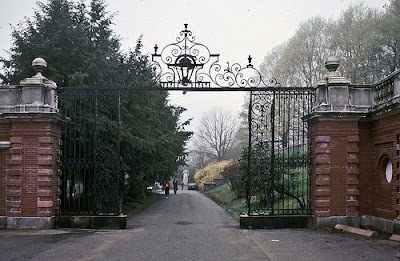 Mary Bryant Pratt was the granddaughter of William Fletcher Weld, a shipping magnate who owned one of America's largest fleets in the mid-19th century. Her family had owned land in Brookline since the 17th century. 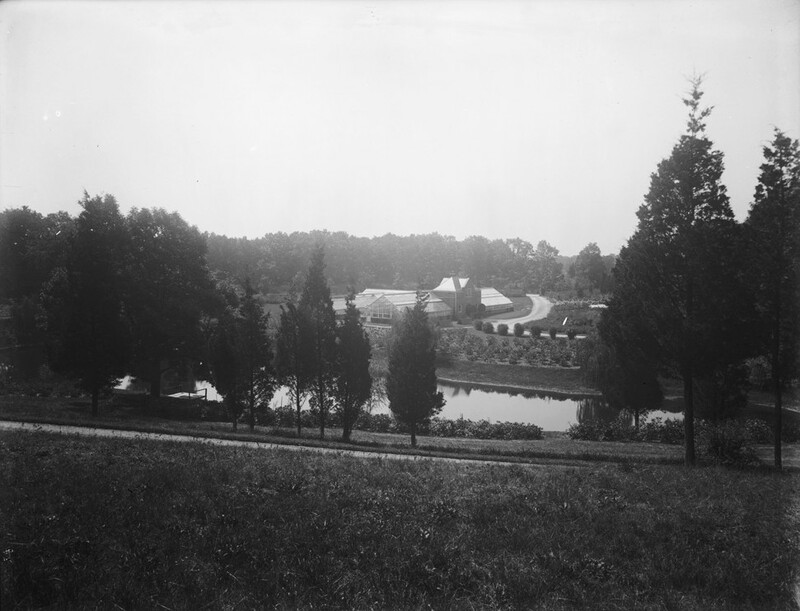 Following her 1891 marriage to former Park Commissioner and future Congressman Charles Sprague, they acquired the Faulkner farm and surrounding lands from her cousin, and proceeded to develop it as their country estate. 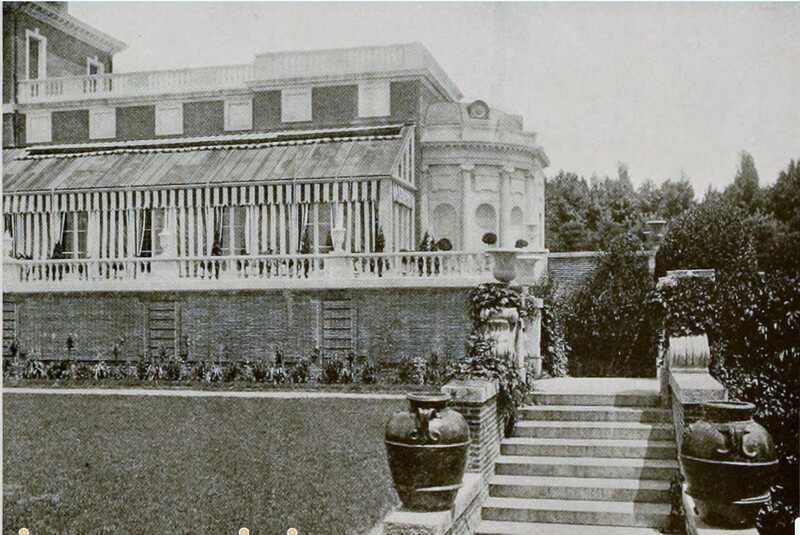 For their architect, they chose Herbert Browne of Little and Browne, a firm that pioneered the Colonial Revival. Browne was an architect with an eccentric flair, and his designs combined traditional form and detail with often loopy Baroque flourishes. 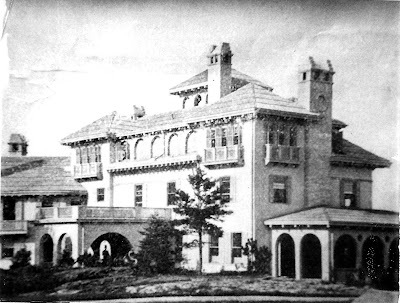 The Sprague house, started in 1896, was no exception. 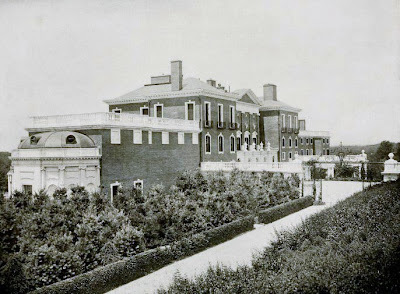 Sited just below the crest of a hill, the house was an enlarged version of the Federal style country estates that dotted the region a hundred years before. 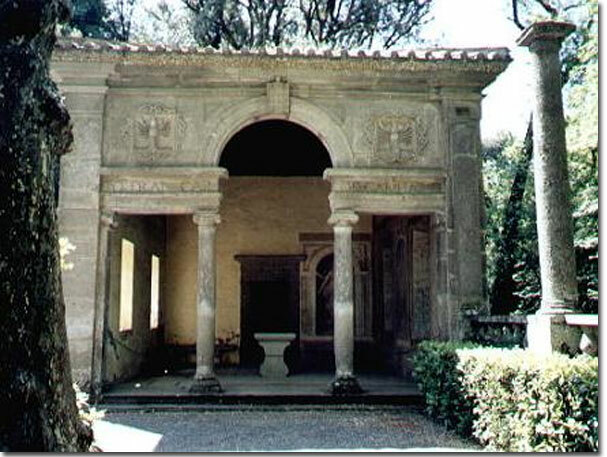 The entrance front was another matter: here proportions and scale mixed it up with a baroque arcade, and a giant curved pediment. 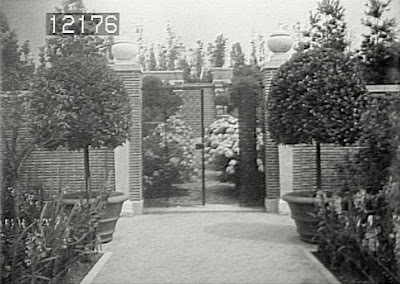 An elaborate fence and wall, 12 feet high, surrounded the forecourt. 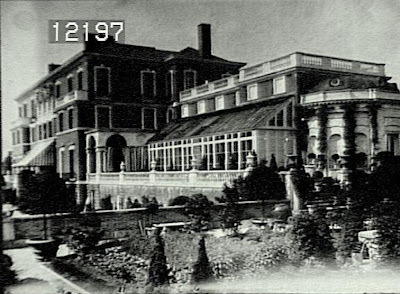 The garden front as originally built, as enlarged in 1903, and as it appears today. 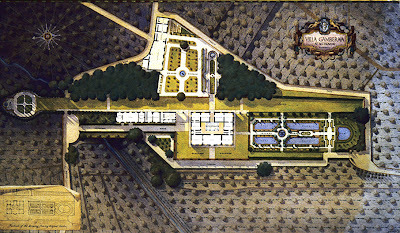 Concurrent with the development of the house, the Spragues almost inevitably turned to the Olmstead firm, less than two miles away, for their landscape plan. Charles Eliot was the associate in charge. 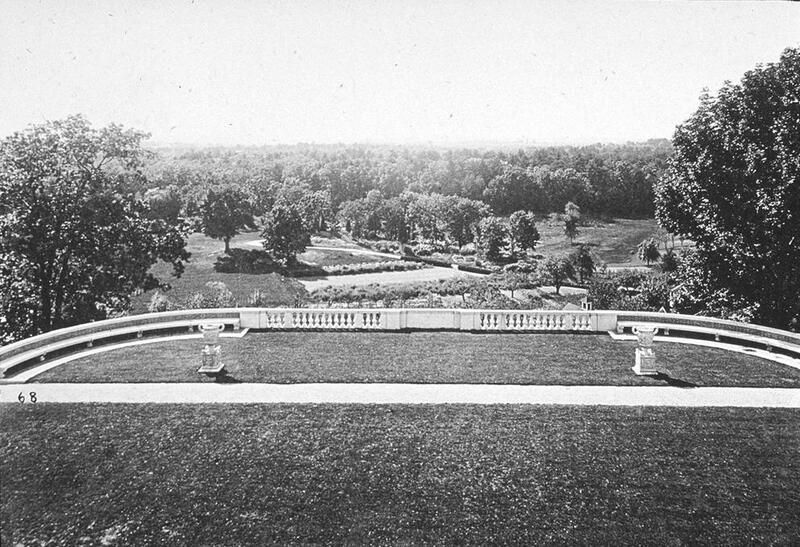 From the first, the landscape project was fraught with tensions. Naturally, the clients had strong opinions of their own---Mrs. Sprague that she wanted a farm, as a picturesque foreground to the view from the house---Mr. Sprague wanted the landscape terraced, not merely planted with shrubbery as in a public park. It seemed that nothing Eliot came up with pleased the clients or the architect, although the trio pushed on. Finally, a large formal terrace was created south of the house, drives were laid out, and relaid. 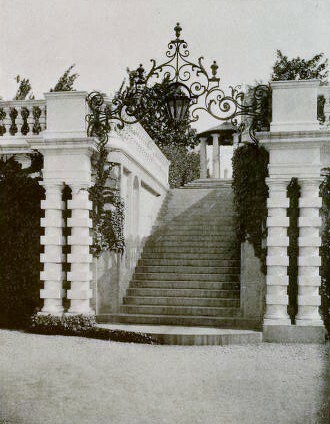 The main drive came in from stone gates on Allandale Street in the neighboring town of Jamaica Plain, and travelled uphill in a straight, impressive line, past the elegant stables and carriage house, for a quarter mile until one passed through an enormous and elaborate iron gate to the forecourt of the house. The forecourt gates. The giant statue of Juno in the distance required twelve oxen to haul into place after it arrived from Italy. The situation soon became untenable, and the Olmstead firm was dismissed. 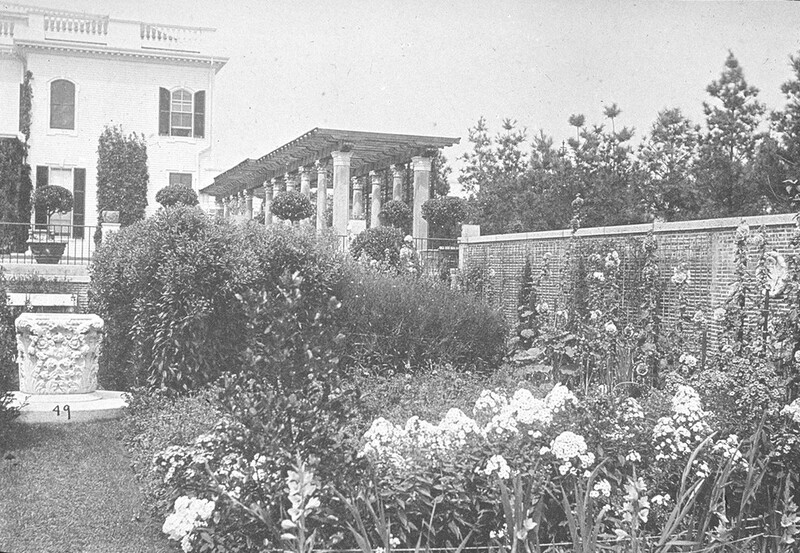 On the recommendation of the their family physician, for whom he had completed a house and garden, the Spragues hired Charles Adams Platt, a relatively unknown artist turned amateur architect who had been making waves in Cornish New Hampshire with a series of small country houses and gardens that merged Italian and New England sensibilities. 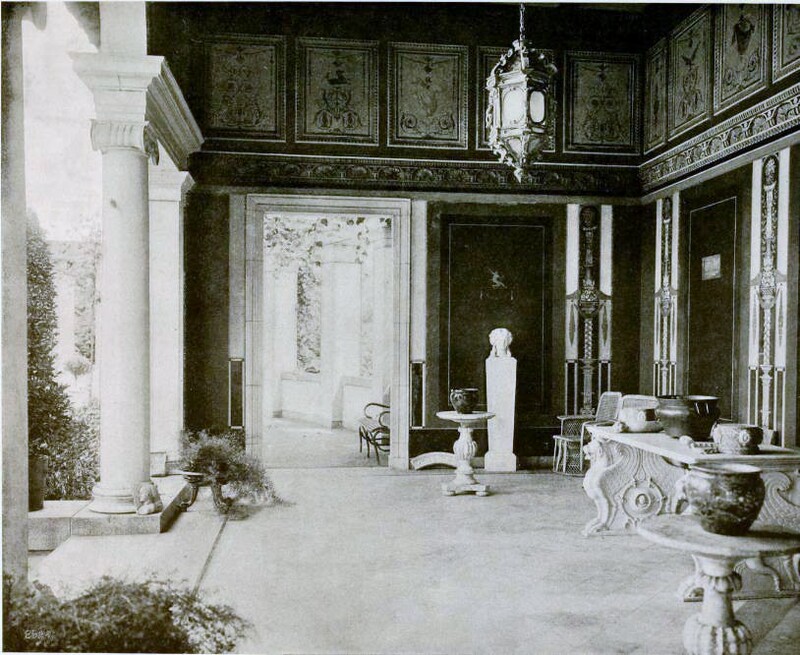 Half a dozen years before, after spending time in Italy, Platt, then known as an etcher and painter, published a volume about Italian gardens, which had been well received, and was well positioned to an audience ready for a shift in taste at the end of the century. 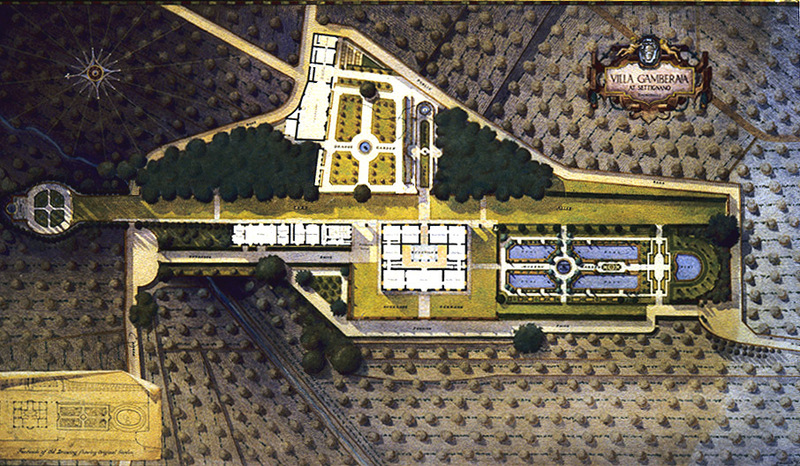 A comparison of the plans of Villa Gamberaia, above, and Faulkner Farm, below, shows how well Platt utilized what he had learned in his studies of Italian gardens. 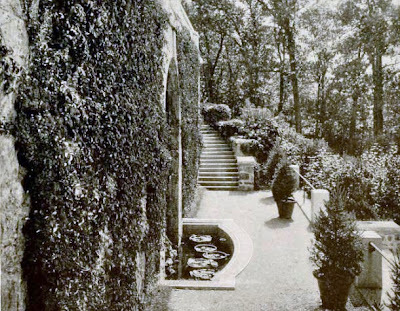 For his first large scale project, Platt turned again to his beloved Italian models, in particular the Villa Gamberaia in Tuscany, whose siting on a terrace at the edge of a hill was so similar to that of Faulkner Farm. 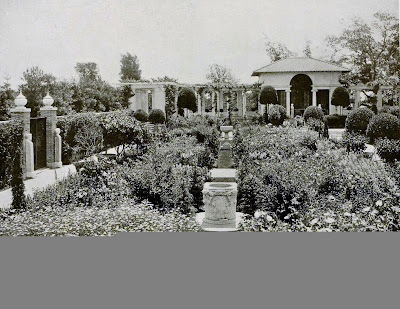 It is hard today, so familiar are we with gardens inspired by this one, to understand how radically fresh the design was to late 19th century eyes, used to either the studied naturalness of Olmstead or the stiff grandeur of the French Beaux Arts.. For the garden, Platt built a 1/2 acre terrace east and below the main terrace, on axis with a drawing room window in the house. 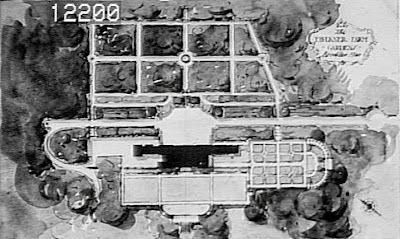 Here he built a garden whose shape an siting were inspired by Gamberaia, with beds filled with flowers, loosely planted in a new painterly style, the whole framed by a peristyle centered on a casino based on one at the Villa Lante, A pool in front of the casino reflected the architecture, and splashing fountains gave sound and dimension. Antique sculptures found on travels to Italy gave the appropriate accents. Long sight lines gave a constant sense of vista. 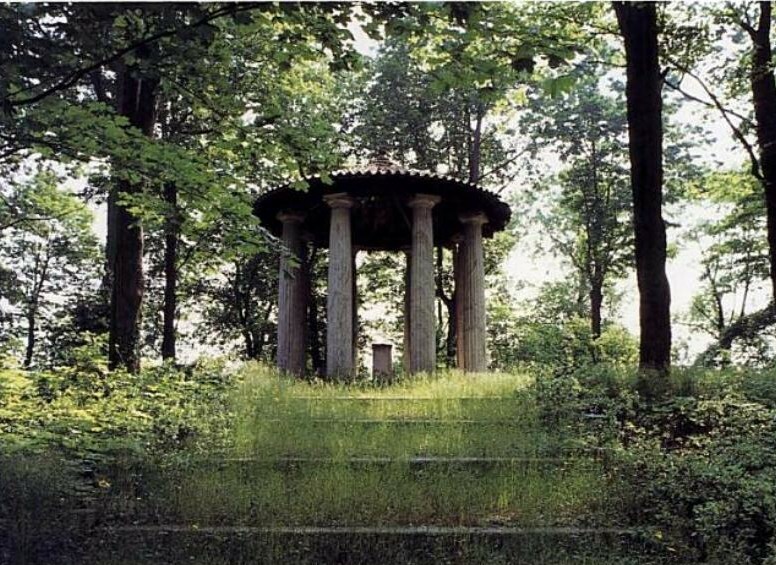 At the hill summit, reached by stairs, was a natural bosquet, formally layed out, centered on a temple. Top, stairs to bosquet from forecourt, and Bottom, the temple and Bosquet as they appear today. 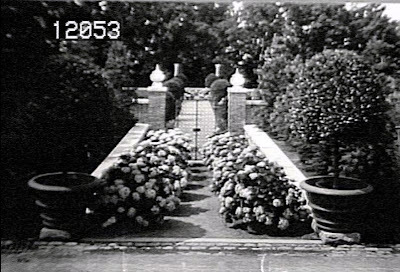 The completed garden was a national sensation. The first pictures of Faulkner Farm were published in Harper's Monthly in 1899, to universal acclaim, and it became possibly the most published in the world for the next 20 years, featured in practically every major design and gardening magazine, and at least two dozen books. Platt's reputation was secured, and for the next 20 years he was to become America's premier country house architect, repeating and refining his formula for many of the finest designs of his day. 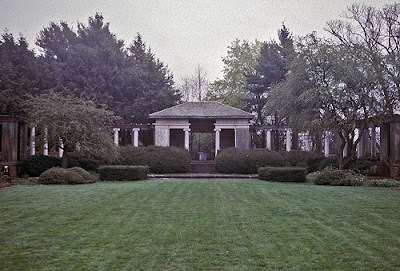 The Spragues were generous with their creation, permitting the public to visit on Wednesdays through the summer months, in a time less concerned with security and privacy than today. In keeping with one of America's greatest gardens, their head gardener, H. W. Craig, was for many years the president of the Gardener's Association of America. Two Views of the casino and pool. The main garden and casino. Top, an early 20th century handcolored slide, Center, as it appeared after simplification of plantings, an the lowering of the casino roof, 1920's, and Bottom, as it appears today. In 1902, while his wife was in Egypt with the children, Charles F. Sprague died of a brain disease. 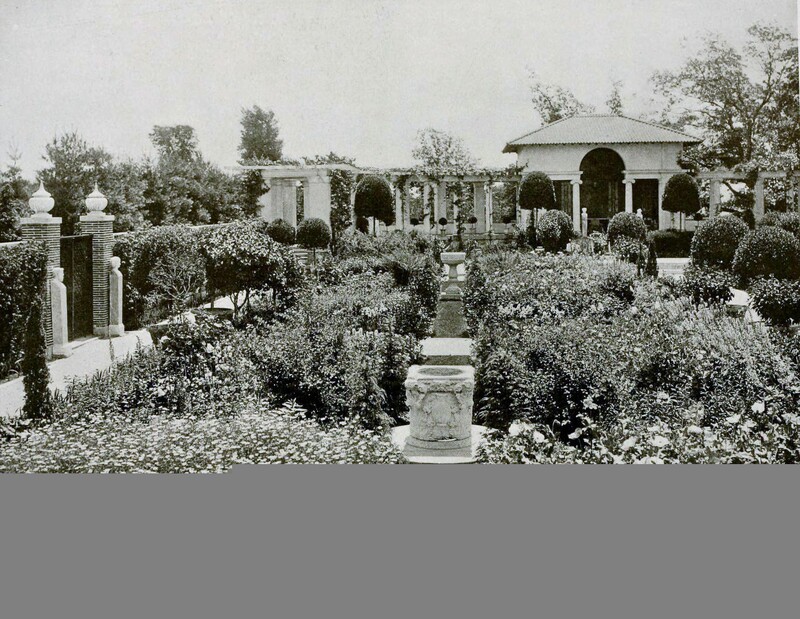 For the next two years, Mrs. Sprague threw herself into renovations and improvements on the estate. 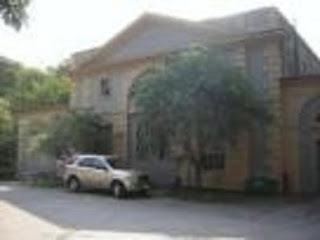 The house was clad in brick, and a third floor, taller than the original second floor, was added. 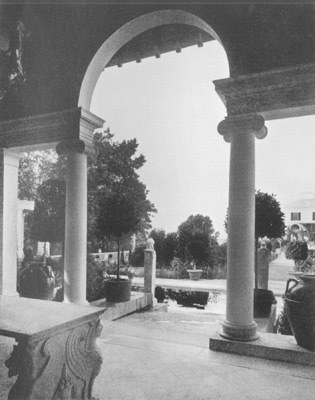 A ballroom wing replaced the marble pergola on the upper terrace. 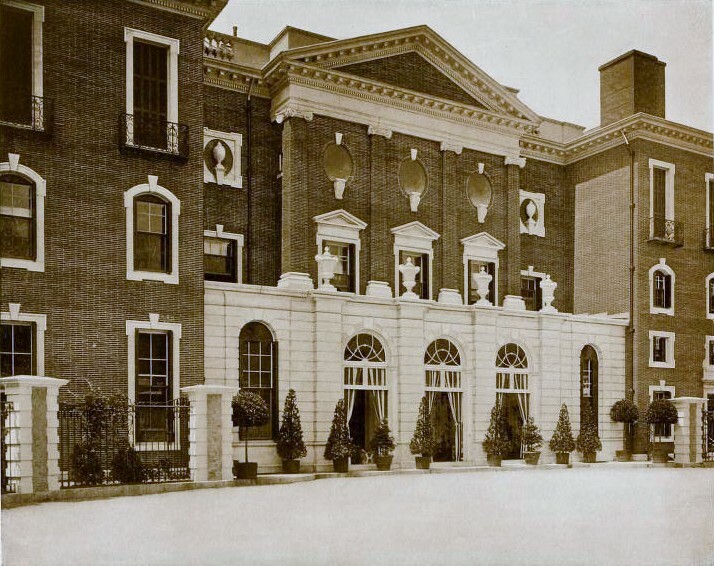 The neoclassical ballroom was one of the grandest private rooms in the Boston area, with allegorical ceiling murals by Allan Schwartz, Gobelins tapestries on the walls, and ending in a domed rotunda that would have done Pavlosk palace proud. On the south wall, six tall French doors opened into a huge conservatory, in turn opening onto the terrace. 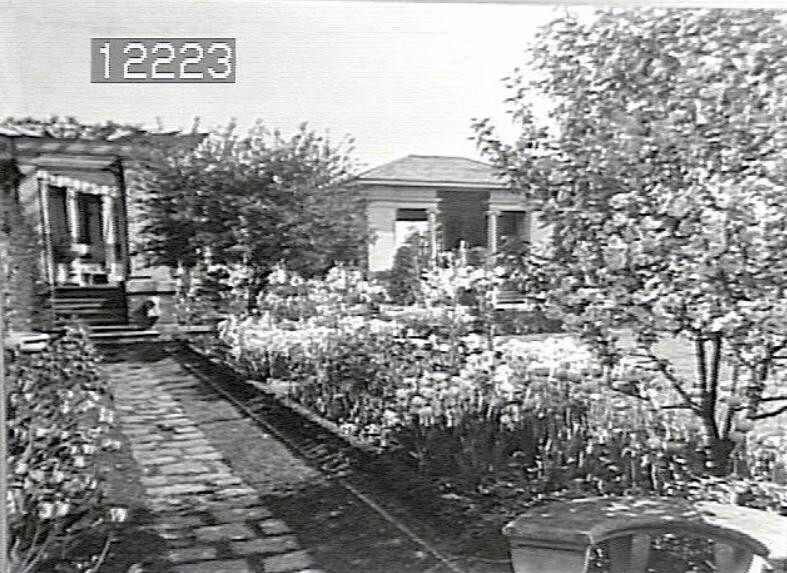 With ground floor and mezzanine, the house now had five floor levels. View of the house from the casino, c. 1900, and today. The view from the casino was compromised by the greatly enlarged house and the intrusion of the ballroom wing. 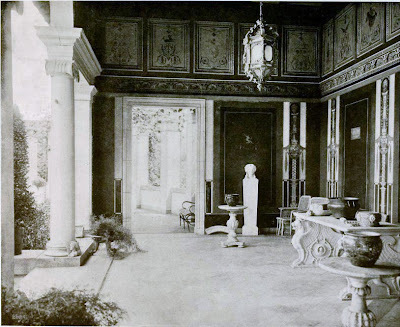 A pergola on the upper terrace was sacrificed for the addition of a ballroom wing, a necessity lacking in the original house. In 1905, Mrs. Sprague remarried, to a friend of her husband's, Utica clothing manufacturer Edward S. Brandegee, and life continued much as before. In the 1920's, the main flower garden was simplified, and the casino inexplicably remodeled, the arch removed and the roof lowered. Stone paths replaced gravel, the parterres were replaced by simpler borders around an open expanse of lawn to accomodate large gatherings. 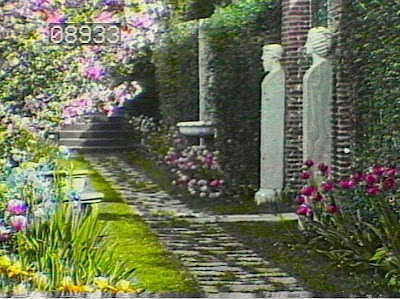 The statuary collection was reduced, and the garden took on the form it has today. Mr. Brandegee died in 1942, Mrs. Brandegee in 1953. Amazingly, Faulkner Farm, now know as the Brandegee estate, or as Allandale Farm, is still in the hands of her descendants. 150 acres remain of the original 192, and are still operated as a working farm, complete with seasonal farm stand, the last remaining farm in greater Boston. The main house has not been occupied as a residence for many years. 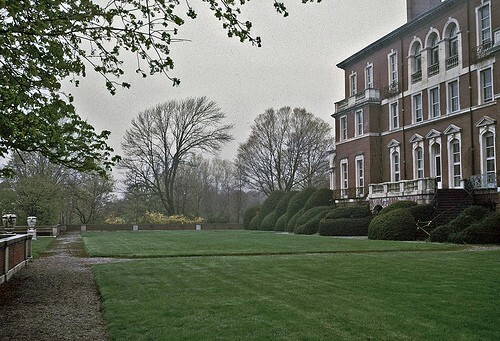 After being leased for many years to the Academy of Arts & Sciences, it is now offices, and occasionally used for private functions, including last year's wedding of John Kerry's daughter Vanessa. The stables and carriage house are leased to the Boston police department, and house the department's Mounted and K-9 training units. 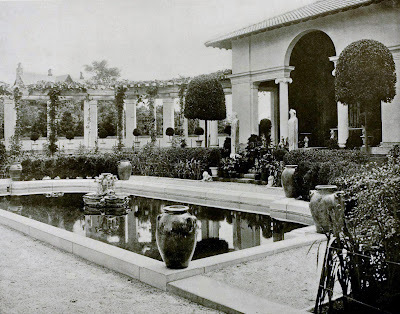 Much of this story is a well known chapter in design history, but I have been mesmerized since childhood by Platt's artistic creation, and offer it here for my readers pleasure. 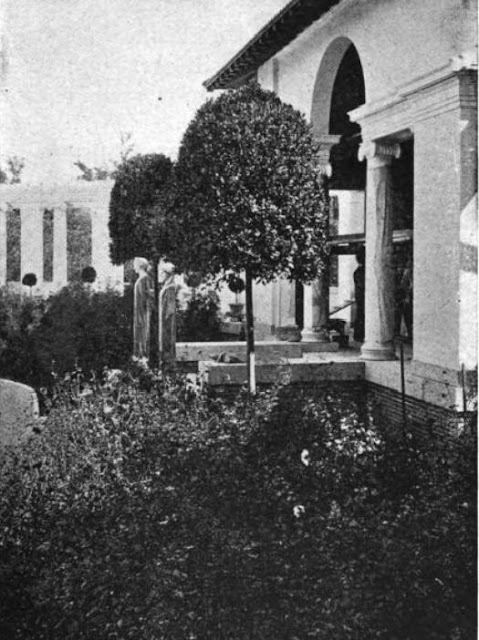 Unbelievably, on a neighboring hilltop, the entire program was to be performed again, by the same team of designers, for Mrs. Brandegee's cousin. Stay tuned for that story. And, being the Down East Dilettante, how do I bring this story back to my part of Maine? 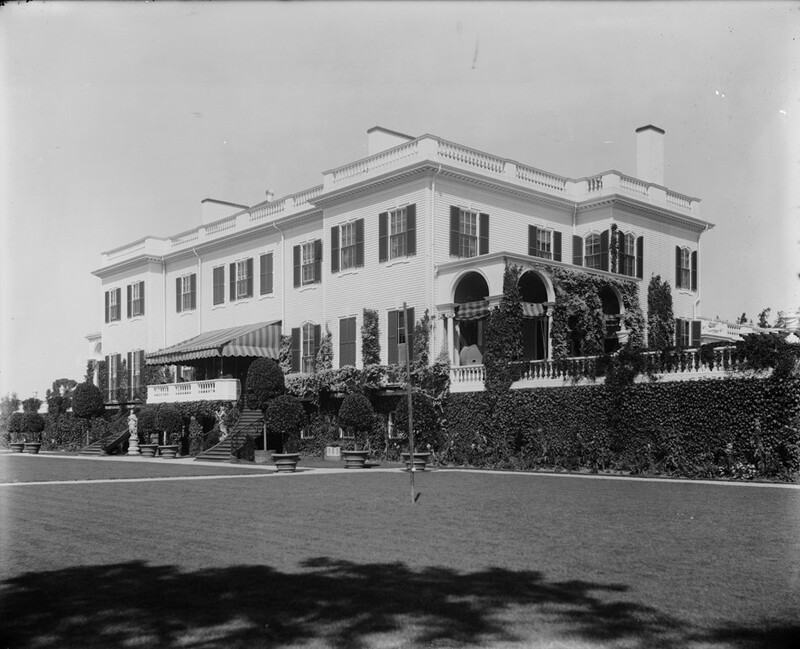 With this photo of Birnam, a cottage at Bar Harbor, designed by Rotch & Tilden, where the Brandegees held forth summers. What a fascinating story. I am crushed to learn that the enchanting casino was altered, however. Thank you so much for sharing this story. My dad grew up in Jamaica Plain. 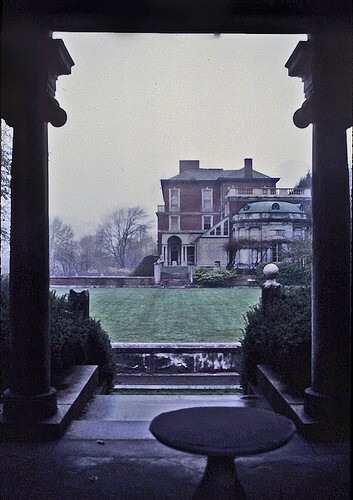 As a young girl I would visit a public park near the Allendale Farm, called Lars Anderson...a beauty. As a working girl, i would cut through the surrounding neighborhoods to get to work in Boston. Thank you for enlightening me on the history of my old stomping grounds. Great sighs heard (muffled by snow) from Kansas. So great a notion: a nation called to gardening. Amazing this much land has remained a working farm. Developers must have developed decades of ulcers over this. Love all the B&W photos mixed in with the color and current pictures. were able to bring it off as a thing above and beyond pastiche. Are there billionaires today who know of the Villa Gamberaia and why it matters? Devoted: Isn't the roof reduction a mystery? Gilded Age:, I know I almost went overboard on the pictures, but I am a sucker for before and after. I'm sorry though, that there were no interior views readily available, though, for they truly are eye-popping in their ecelecticism. Toby: It wouldn't appear so, would it? 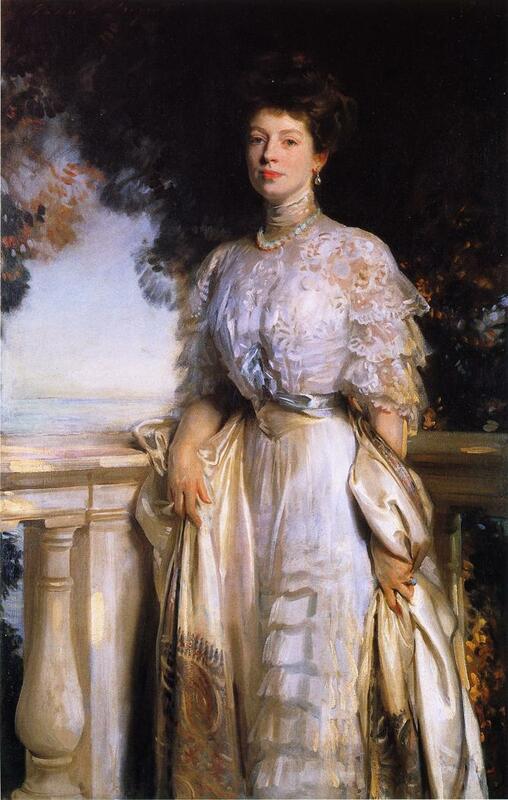 Mrs. Brandegee appears to be a model of enlightened patron with deep pockets. If only modern money would have such taste. I should know better now than to read your blog in the morning when I need to get things done because there is really no such thing as a "quick look." And then, even worse -- or better, actually -- when it says "You might also like:" I always do. Fascinating stuff. 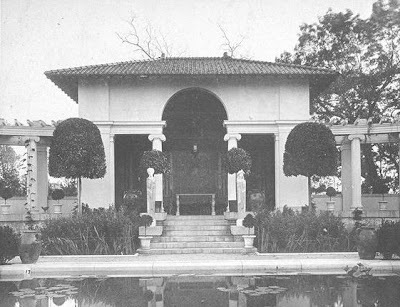 Did you run across an estimate of how much of the Sprague's $30 million this little place consumed? Ancient, According to Alan Emmett, the architect's account books show expenditures of $182,000 on the original house, terrace, stable and iron gates as of 1896 (Money really did go sooo much further in those days. 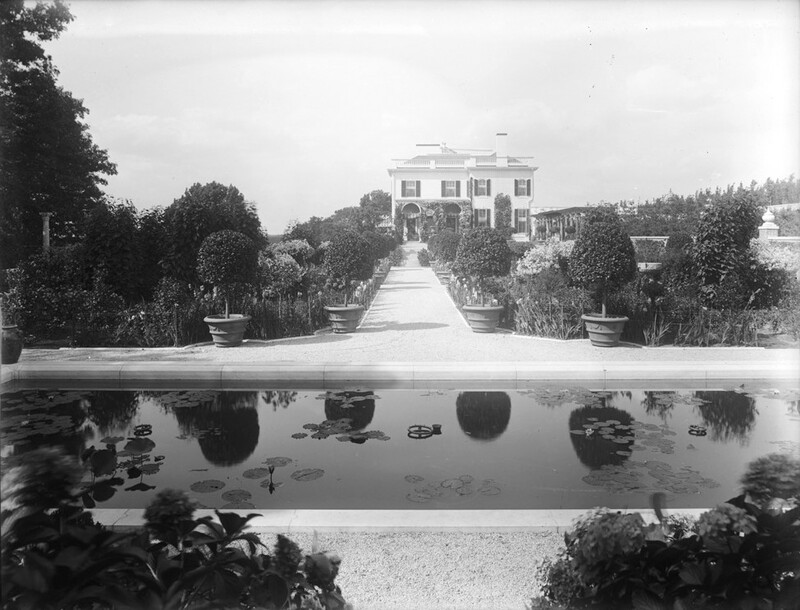 The cost of the gardens is lost, and the 1903-1905 alterations to the house came to more than the entire original construction costs eight years before. I believe that one multiplies by a factor of 26 for cost in today's dollars. Great post! Can't get enough of Platt's work. P.S. And you are right on the Casino. Definitely there. Down East, your post are so well researched and detailed I am truly humbled. The history of this country in the building of these grand estates is so enlightening. I feel like I've been transported to the set of "The Age of Innocence." I expect Winona Ryder set upon me with her crazy dead eyes demanding to know if her bonnet is straight. Echoing Topaz! 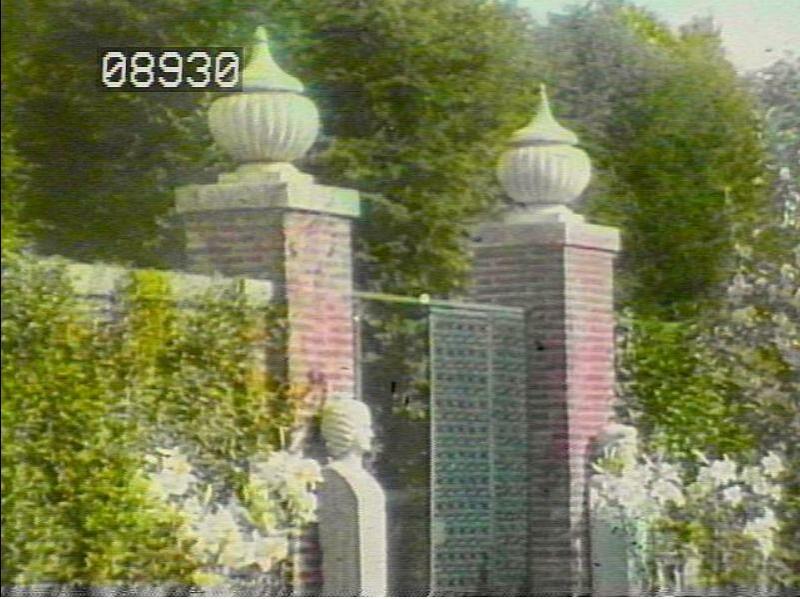 And with so many thanks for so many chewey riches, my brother the landscape architect adds his as well, it's just something ELSE to consider the 12 oxen et al who managed to set Juno dead center below the scrolled header of the iron gateway. What a time and place to have lived a (well-placed) life! Dear DED, what a wonderful post! The Faulkner Farm, now hidden behind the ugly Faulkner Hospital, is only a few minutes from my house. 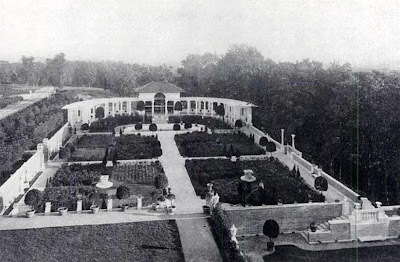 I had the thrill many years ago of attending a seminar series called "The Country House in American" by SPNEA given in the house's ballroom and remembered spending every coffee break dreaming of restoring the Italian garden. Sad how it's been left to slowly decay. I drive by Allandale Farm every day on my way to work and you can just see the house on the hill far beyond. 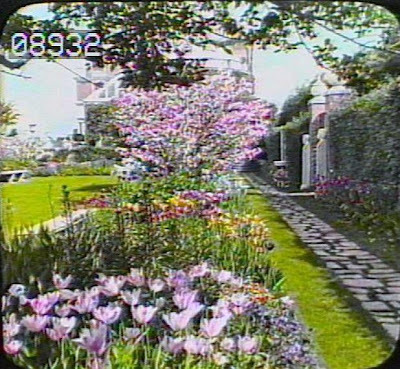 What a truly American interpretation of a great European house and garden! Platt was a true master. 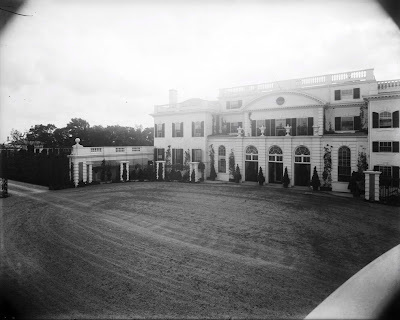 My father often spoke of the house while I was growing up since as an officer of the BPD assigned to Jamaica Plain, he so enjoyed visiting the horse stables. Coincidentally, I received the book you mentioned this Christmas. What a treat! M.
Sadly, the Boston police department mounted unit is no more, having been dismantled due to budget cuts in June 2009. Some of the steeds are now enjoying life on the Cape as part of the Plymouth PD. 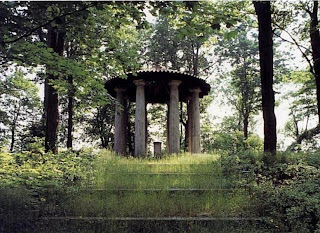 Very much enjoyed your articles about the Brandegee estate (clearly the source of the new Juno statue making a big splash at the MFA) and on the gardens at Weld. Just fyi, Olmsted as in Frederick Law Olmsted is spelled without an "a". It's like fingernails on a black board to see it with an "a". Best wishes. Thank you for this great information. I discovered this amazing place today by pure chance through a friend who is now at Springhouse. In the fall foliage it was magical. Informasi seputar Obat herbal aman untuk anda tentang. 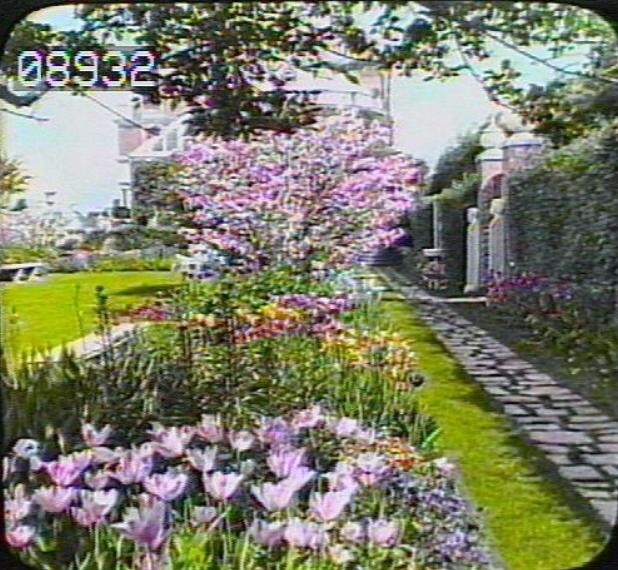 "THIS GARDEN WAS MADE IN 1901 AND NAMED WELD"